This linear light is designed for maximum intensity illuminance. It includes 10 super-bright LED lamps and a light controller inside a special thermally conductive aluminum housing. The light controller offers lots of flexibility. For strobe applications, the LEDs will turn on within 15 microseconds. Enable its burst mode to deliver a 500 microsecond burst of super-bright light. Or disable burst mode for continuous operation, or to use with an external PWM controller. You can control the LED intensity using the built-in potentiometer, or via the 0 – 10 VDC intensity input. The light has an auto-reset circuit to protect the LEDs against damaging over-temperature conditions. Three small LEDs indicate power, strobe trigger, and fault conditions. 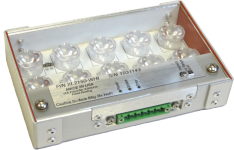 The housing has a Phoenix connector for terminating power, NPN and PNP strobe triggers, analog intensity control, and over-temperature indication. Available with pure, neutral, or warm white to deliver 13,140, 11,940, or 10,740 total lumens when strobed, or 5,590, 5,080, or 4,570 lumens continuous. Choose from 16, 23, or 39 degree optics.